Eagle Superabrasives is a premier supplier of diamond grinding wheel, CBN and CDX supplies in the United States. Ninety-percent of orders are made on location at our Hickory, NC, headquarters where they are ready for same-day shipping. Custom orders can be shipped in as little as seven days. A diamond grinding wheel is one of the most advanced super abrasive tools in the industry. Diamond is the hardest material known, so it makes it an ideal super abrasive when working with difficult to grind (DTG) materials. We recommend using a diamond grinding wheel when grinding carbide, glass, ceramics, quartz, ferrite and other non-ferrous materials. Diamond isn’t recommended working with ferrous materials such as steel because of the carbon makeup. When diamond is used against steel at high speeds and high temperatures, the super abrasive begins to lose its strength because of the breakdown of carbon atoms. We can create our diamond wheels with vitrified bonds. The combination of the vitrified bonds high thermal stability and its ability to maintain wheel structures allows for a more efficient cooling delivery to the grinding zone. Diamond grinding wheels don’t typically lose their productivity from use. Instead the breakdown of the bonding layer causes a subsequent separation from the metal core. Our chemist and engineers at Eagle Superabrasives are constantly developing and testing new bonding techniques to ensure that our bonds don’t prematurely breakdown and cause you to lose productivity. We customize our diamond grinding wheels to your preferences and have multiple bond options available such as; resin, CDX Bond, Vitrified, Hybrid or metal bonds. Each bond is specialized to the material that you’re working with, feel free to ask our experienced staff which bond and wheel type would best fit your needs. The price of a diamond grinding wheel can make it hard to understand the benefits of replacing cheaper conventional grinding wheels. 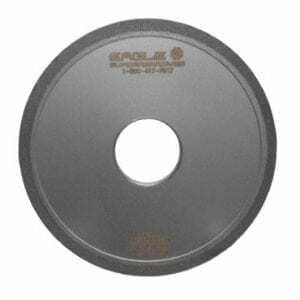 However, the benefits of choosing a diamond grinding wheel will quickly become apparent once in use. Our experienced staff will provide support and advice along the way. With unparalleled customer service, superior products and fast shipping, Eagle Superabrasives is an easy choice for all your grinding needs. Contact us today to place an order! ©2014 - 2017 Eagle Superabrasives, all rights reserved.